Welcome to the LTSP cybertent. The LTSP cybertent in full swing. What is the Hes Fes? The Hes Fes (Home Educators' Seaside Festival) is a yearly gathering for people involved in or interested in Home Education; that is education of children privately in the home by the parents, rather than in state or public (private) schools. The parents may be solely responsible for the education of their children, or they may work in groups with other parents, taking it in turns to provide education for children from a range of families. The Hes Fes began in 1998, and has been held in Charmouth, Dorset (UK) since 2000. It is currently the world's biggest gathering of home educating families. 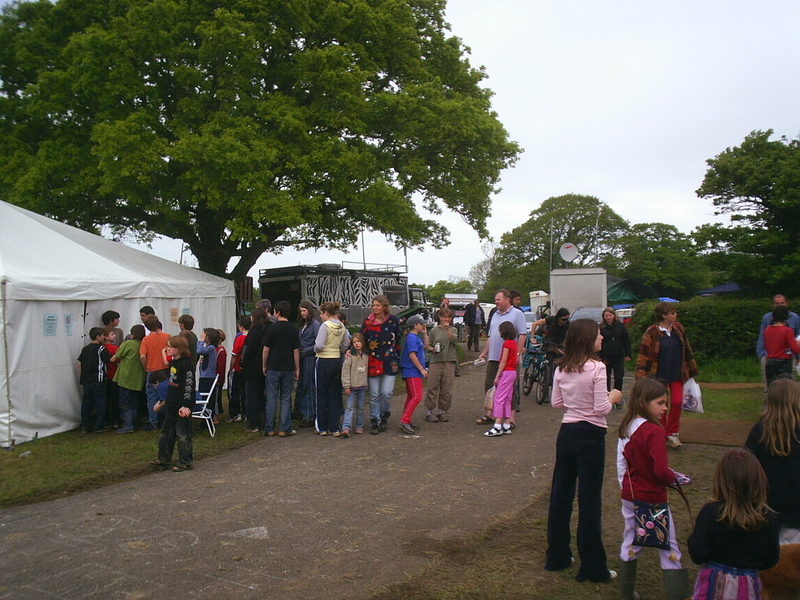 The 2005 Hes Fes was the tenth event held in eight years with people attending from all over the UK, as well as the USA, Finland, Sweden, France, Holland, Spain, Portugal, Italy, Poland, Germany, and elsewhere. The Hes Fes is a packed week of workshops, crafts, music, events, conferences and more. 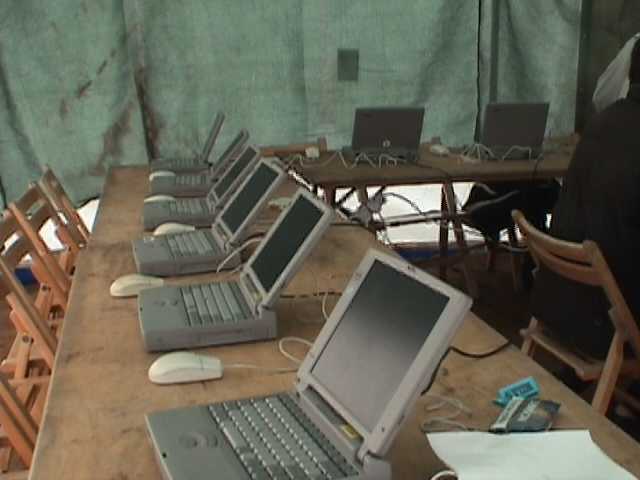 In 2003, Psand.net visited the Hes Fes to provide live streaming of the music, conferences and children's cabarêt and, as a side-line, we enabled some access to the Internet with a handful of terminals and a wireless network (Wifi hotspots). This proved so successful that we were asked to return and this time provide Internet access on a larger scale. In order to do this, we joined forces with the Bristol Wireless project. We were allotted a nice, but slightly dull, small, square marquee with tables and chairs which we converted into a 20-terminal cybertent that ran for the entire week. 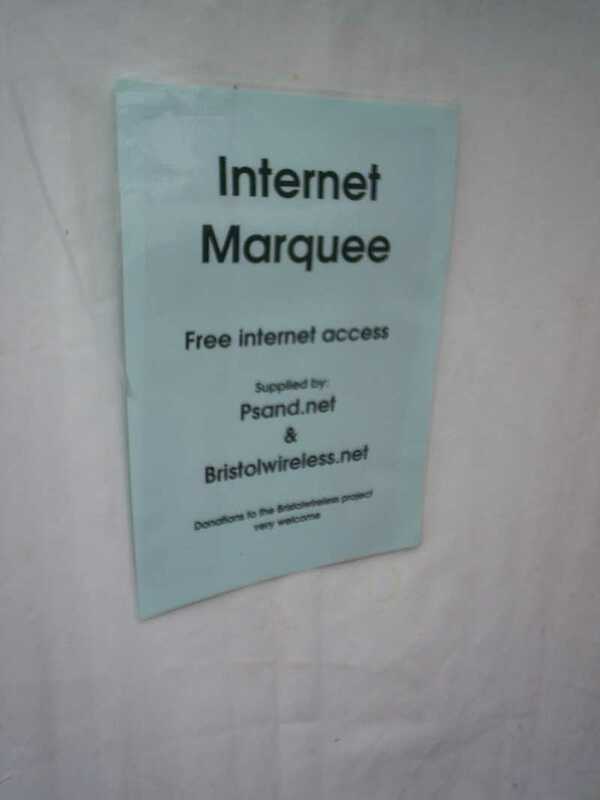 Bristol Wireless is a community network project that began in the city of Bristol in May 2002. Its goal is to link the city via an open, community-oriented wireless network for the mutual sharing of information and opinions regarding local issues and interests. 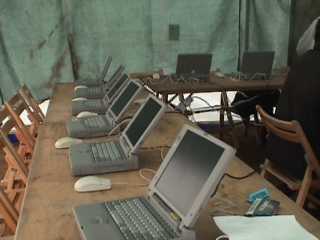 It is heavily founded in the freedom afforded to it through the use of free software and the importance of the reuse of so-called "redundant" technology to provide people who are perhaps unable to buy computers for themselves, access to technology and the Internet. Psand.net specialises in satellite and wireless communication networks for events and outreach projects. It was established in 1996 to promote the use of GNU/Linux and free software. Since 2002 it has been providing Internet connectivity at a wide variety of events in the UK and Europe, from large-scale commercial music festivals to the historic anti-war protests in London's Hyde Park, as well as local community and environmental events. Psand.net is also an ISP providing Internet services to individuals and organisations on a bespoke basis. The free software phenomenon, started by Richard Stallman's Free Software Foundation in the form of the GNU project, is about the ability to express our artistic freedom in creating something, and to share that creation without limitations. In their own words "LTSP is an add-on package for Linux that allows you to connect lots of low-powered thin-client terminals to a Linux server. Applications typically run on the server, and accept input and display their output on the thin-client display." Essentially LTSP is the joining of several technologies together to form a complete package, that is easy to install and operate, for powering thin-client terminals. The technologies employed are Etherboot, for remotely booting an OS over a network, DHCP for automatically assigning IP addresses and network configuration to clients, NFS for providing remote file systems and X11 for providing a complete, remotely-run graphical environment for users. Although it is possible to build this package (and in large-scale UNIX and Linux, this is exactly what people have been doing for decades), for most of us the question is "why bother, when the LTSP team have already make an excellent job of doing this for you?". Try it, it rocks! Connection to the Internet was provided by the use of a bi-directional satellite dish provided by Psand.net (comprising a Norsat dish and an EMS Technologies satellite terminal) connected to the Internet via the Astra satellite network. For more details of this unit and its operation, please refer to this previous article. The dish gave us a connection of up to 2Mb/s down the way and 384Kb/s up the way, although tests we have done show this to be commonly (or more reliably) in the region of 1.5Mb/s down and 250Kb/s up. 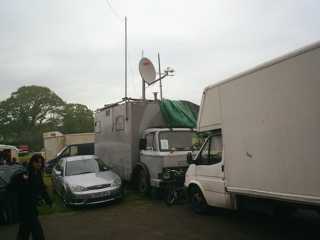 The dish for the satellite connexion was mounted on a communications vehicle located within the crew area of the festival. The EMS satellite terminal (effectively a modem) was connected to a computer configured as a router, which provides certain additional services to compensate for the larger latency of connexions via satellite. This box features DNS and web cacheing proxy servers and hacks to increase the TCP Window Size for packets travelling over what is known as an LFN as well as a DHCP server to provide IP addresses to client computers connecting to the network. Mobile Communications Vehicle located at the Hes Fes with satellite dish and omnidirectional antenna mounted. 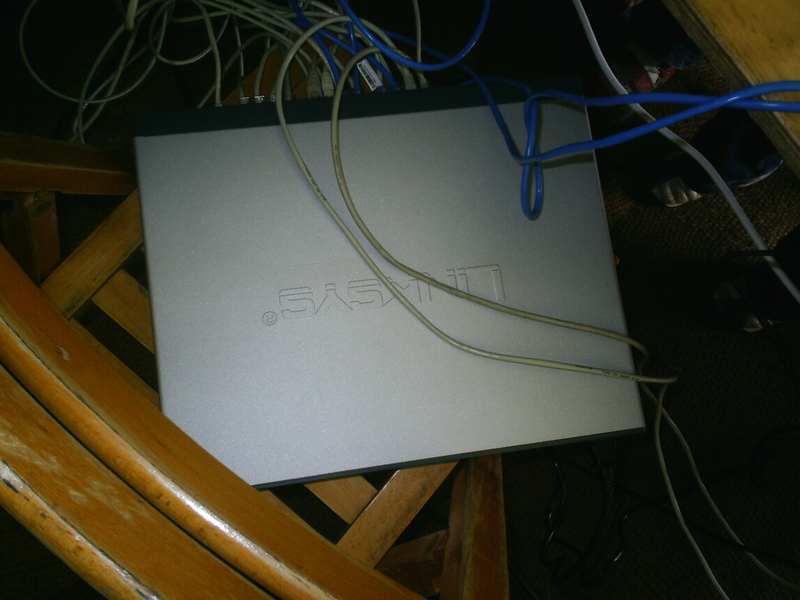 The "LAN side" of the router box was then connected to a switch and to this switch, a standard wireless base-station and the LTSP server laptop. The model of wireless base-station used was a Buffalo Technologies WBR-G54, which although capable of 54Mb/s, complying to the 802.11g standard, was actually configured to use the older 802.11b 11Mb/s standard as we needed to ensure that the majority of wireless clients could connect to our network. This was used to provide an open-access open-node wireless network for those wishing to plug in their own laptops. To extend the range of the wireless network over the Hes Fes site, a home-made quarter-wave omnidirectional antenna was employed. This was connected to the external antenna port on the base-station via a pigtail to a URM67 coaxial cable, and then up a mast mounted on the top of the communications vehicle to the omnidirectional antenna. 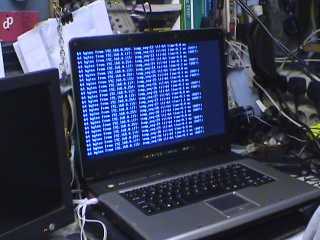 The LTSP server laptop in mission control. 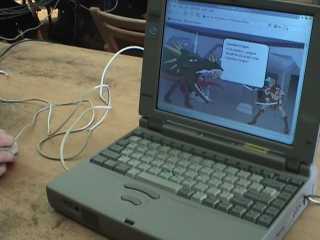 The server for the LTSP laptop was an Acer Aspire 1520 bought with money given to Bristol Wireless by The Scarman Trust. This laptop was fully-loaded with an 80GB of hard disc and 1.25GB RAM. The laptop was installed in the communications vehicle to keep it safe. 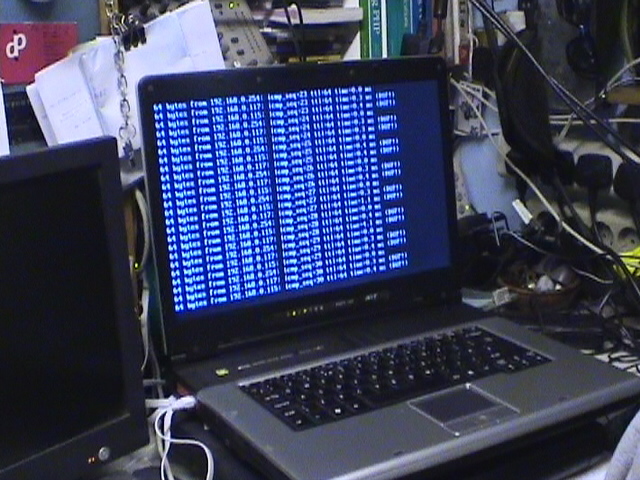 The laptop had Debian GNU/Linux installed and LTSP. There were two network cards, one for the public WAN connexion to the Internet via the satellite link and the other the private LTSP 1GB LAN. This second link was made via a long Ethernet cable all the way from the communications vehicles to a Linksys 24 port 10/100MB switch with a gigabit port, in the cybertent. Gigabit switch used in the cybertent. For the suite of LTSP client machines, we had 20 Toshiba laptops at our disposal, kindly donated to the Bristol Wireless project by Serco. These machines were around ten years old with first generation Pentium processors running at 120 MHz, most of them with sound and some with CD-ROM drives. Although they were not really suitable for running a modern operating system on due to lack of RAM, hard disc, video memory and processor speed, the marvel of LTSP is that a client machine needs very little resources to work as it effectively acts as a remotely-driven screen and keyboard, the modern equivalent of the dumb terminals of the 70s and 80s mainframe eras. In theory, LTSP thin-clients do not require hard discs, CD-ROMs or floppy discs as they are able to boot via the network. However, as these were laptops that needed to use PCMCIA Ethernet cards, which would not support booting via the network, we had to have a bootloader installed on the hard drives of each machine for them to boot. We could have used floppy discs to do that, but we felt that it was cleaner to have it on the hard disc and they certainly booted a lot quicker that way. In addition to setting up and running the Internet tent over the six days, for between five and eight hours a day, we also got involved in a number of other activities, described below. Alternative Licensing Models: This workshop introduced and discussed the issues surrounding intellectual property rights and the principals behind so-called Free/Libre and Open Source Software (FLOSS) and the wider application of the ideals involved to other creative fields, including writing, music, pharmacy and even genetics. Learning Resources on Linux and the Internet: This looked at what programmes are available for GNU/Linux for education purposes. It also looked at online learning and information resources such as the Wikipedia and Indymedia projects. Desktop Migration: This looked at the options available for migrating to FLOSS, including the different distributions of GNU/Linux, live Linux boot CDs and FLOSS applications that can be installed and run on Windows and Mac OS X. All the workshops were a resounding success, particularly with the adults, and the feedback was very positive. Everybody who was involved learnt a lot of useful information. As part of the workshops, and at other times, we also distributed free copies of Simply MEPIS Linux to people interested in trying the system. On Wednesday afternoon, conferences on home education were taking place and we were asked to help provide a solution to them for live link-ups with other countries. There were several speakers who were taking part in the conference, but they were located in other countries (France, Switzerland and Germany). They were to speak in their own tongues and the questions and their responses were to be translated live from and to English by translators at the Hes Fes. The solution that we came up with was to use a certain well-known VoIP programme to provide the link-up. The reason for using this software was to find a quick and easy solution and to make it simple for all those taking part to install it and get it up and running. To accomplish this there was a laptop running a Skype client with the output plugged into the PA system so that those in the marquee could hear the speaker from a different country. On the stage, a microphone from the translators and "question askers" ran to a mixing desk, and this channel, as well as going through the PA, went to the laptop and was the input for Skype. A sub mix was required for the Skype input, devoid of the Skype incoming signal, to avoid the guest speakers hearing an echo of themselves in their headphones. The conference was interesting and went very well, and the live VoIP hook-up worked perfectly. During the Conference, to avoid any internet bandwidth issues there was a network gaming session in the internet marquee, with no internet traffic allowed. Wednesday night was cabarêt night for the adults and a special appearance by the band SPAND at 1.30 AM to demonstrate their Space Echo, provided an entertaining finale. Another "world's first" perhaps? Well, certainly a Dorset first! Queue of people in the morning eager to enter the cybertent. The cybertent was a great success. Our clients were mainly children who queued patiently and then stampeded the moment the door opened. Main activities were runescape, hotmail, yahoo, checking webstats on their websites and remarkably the local chat client (20 kids in a room saying nothing but chatting to the person literally sat next to them through the chat window). The Pentium-class client laptops performed far better than we expected, every client booted and ran with very few hiccups. The only technical issues experienced were the occasional unplugging of the network lead or an accidental pressing of the off button. We were open for at least 5 hours a day and about 150 people passed through on a daily basis. It did seem to be a little like a cybercreche as the majority of our users were under twelve years of age. We also had a network gaming session. Some people were playing interactively and others on their own. Interestingly, we also attracted a few adults to the gaming. The suite was full and functioned incredibly well. Due to the popularity, we set up a table for email, what's on guides and public transport timetables and this helped enabled a faster turnover. At the end of the sesson, when we shut down the thin-clients remotely, there was a collective groan of complaint from the users. Some kind of time restriction is required, where after a certain a time, users would be required to rejoin the queue to continue. 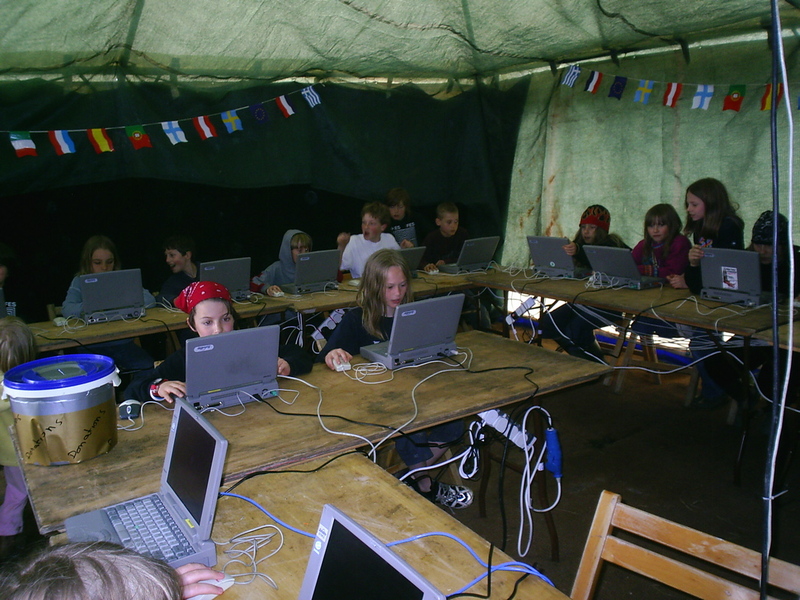 It is a possibly unfortunate reality that when children are given free access to computers and the Internet, they have a tendency to become thoroughly engrossed and it can prove very difficult to tear them away from their terminals. Some sort of ordered shift system would be needed next time, as otherwise other children, and especially the adults, can never get a turn. A ten minute table worked fine. It meant that everyone got the opportunity to check their hotmail accounts. However, next time we should probably dedicate more computers to a 15 or 20 minute table. Censorship is a delicate topic. We did not want to scaremonger parents on the dangers of the Internet and the possible corruption of their loved ones, nor impose censorship ourselves as we believe that autocensorship and guidance from parents and other responsible adults is far more effective. The solution of recommending parental guidance for this uncensored resource was a good one, but one that thankfully was not required. Make sure your browser has got all the latest plug-ins installed as the kids will demand them. They are likely to visit far more exciting and dynamic web sites than you, so don't think that everyone just reads Slashdot and remember that Java and Flash are essential. There doesn't appear to be a Shockwave plug-in for Firefox under Linux. We suggest petitioning Macromedia about this. Try to keep your Ethernet cables well off the ground when in a field in England as cleaning the mud off a 30-metre cable is a laborious task. Be careful with your open node. It is possible that some hideously trojaned Windows machine might connect to it and start chewing up your bandwidth. A filter for peer-to-peer networks would be a good idea, or the vetting of machines before they connect up, by registering the MAC addresses of their wireless interfaces to permit connexion. Windows XP has a enormously complex way of handling wireless networks. Never before have so many different screens and options been seen. It normally seems to take around ten minutes to get one to connect. A Macintosh generally just connects and works. Linux can be tricky, but satisfying. At festivals and events people often wish to download the photos they have taken with their digital cameras and take a CD-ROM of them away or have some of them printed. A separate machine dedicated to this and connected to a printer would be a good idea in the future. People seem to have woken up to Linux and free software. We experienced hardly any of the resilience that we did when we did a similar thing three years ago. Many people had already seen it, some were seriously considering using it, and others already were. Workshops are a good approach. The modern paradigm of an open group with facilitators can be a much more profitable learning experience and more open space for the exchange of ideas than the older teacher-student model. Everyone can learn something this way. We had problems with people moving the laptops around and therefore stretching the power and Ethernet cables. Perhaps we tied them too tight without enough slack, but we did this to make sure they were tidy and out of the way. One suggestion that came up would be to use velcro to attach the laptops to the tables. Written using GNU Emacs and Bluefish. Photos manipulated with The GIMP. If you have any comments on this article or mbharris.co.uk/articles, please send an email to contributions _at_ flakey _dot_ info. 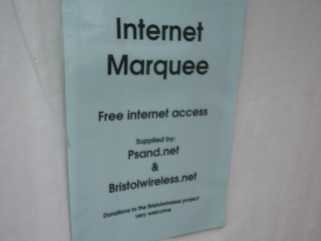 Article copyright (c) 2005 Psand.net and Bristol Wireless. Permission is granted to copy, distribute and/or modify this document under the terms of the GNU Free Documentation License, Version 1.1 or any later version published by the Free Software Foundation; with no Invariant Sections, with no Front-Cover Texts, and with no Back-Cover Texts. A copy of the license is included in the section entitled "GNU Free Documentation License".